Pro Audio for sale - mics, mixers, Pro Tools, rack gear, musical instruments. Equipment for the studio or in the field. The Audix RAD360 is a true diversity UHF wireless microphone receiver. This operates in the 638-662Mhz band (please check your current and upcoming local laws to ensure compliance). Features 193 selectable frequencies (per system group), menu drive display, synthesizer controlled via Phase Locked Loop (PLL) for stable RF signals, audio meters, gain adjustment, balanced XLR audio output, unbalanced 1/4" audio output. This is for a lot of 3 receivers. No transmitters or microphones are included. 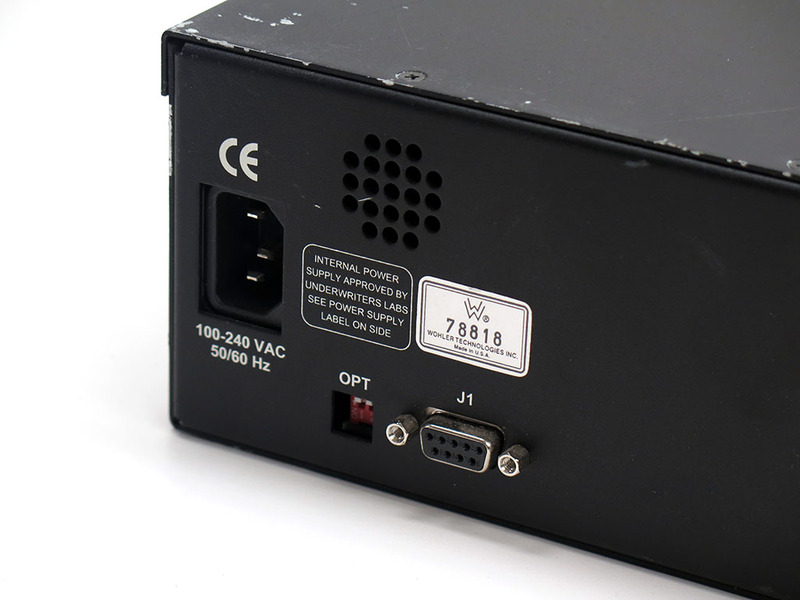 Power supplies are not included, though was tested with a universal power supply to ensure they correctly power up. Each receiver includes both antennas. Cosmetically there is light surface scratches, but overall give a clean appearance. Two of them are missing the rubber feet on the bottom. These are in working order, but are not a complete system, just 3x receivers with antennas only. The Bryston 875HT is an audiophile grade 8- channel power amplifier, most commonly used in a home theater setup with surround sound processor. Equally at home in a studio. Capable of supporting 7.1, 6.1, 5.1. Capable of 75W into 8ohms per channel or 100W into 4ohms. Bridged mono mode allows higher power per channel (250W per channel, up to 4 channels) per Bryston 875HT. Inputs are XLR balanced or unbalanced single-ended RCA. The output binding posts offer three different connection options - banana plug, spade lug, or insulated wire up to 3AWG stripped bare 5/8" to 3/4". The power up sequence can be controlled from a 12V control voltage. Dimensions: 19x19x3.5". Weight 55lbs (25kg). Bryston products are built so tough and high quality that they offer a 20 year warranty from original date or purchase - this is a serious high-end power amp! 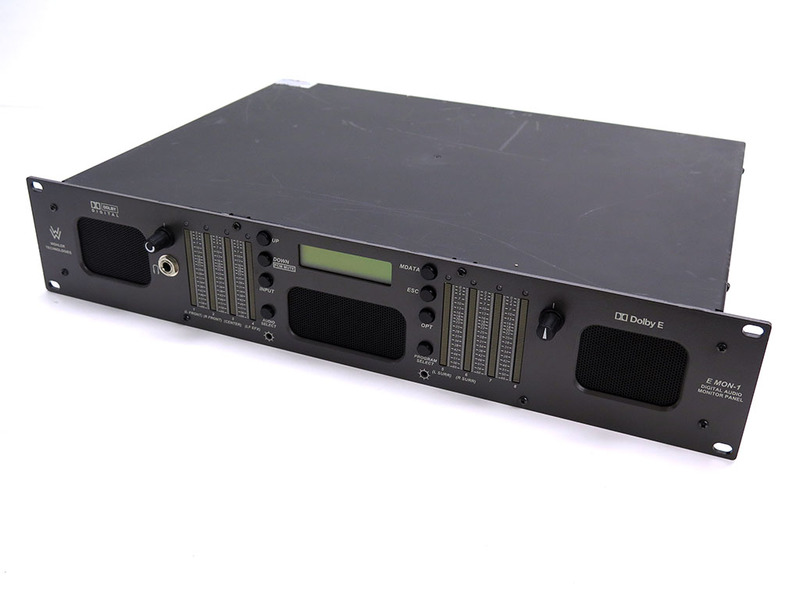 Includes 19" rackmount faceplate. This is the version with the black faceplate instead of silver. Setup for 120V voltage. Cosmetically has some paint wear and touchups on top cover, but faceplate is clean and overall is in acceptable cosmetic condition. Tested in excellent working order. Multiple units available. The Dolby DP570 Multichannel Audio Tool simplifies the preparation of content intended for Dolby E and Dolby Digital encoding applications. Can completely configure and control the monitoring environment as well as set metadata parameters - making it a key product for facilities that master, author, or broadcast program material with Dolby surround sound audio. Can monitor exactly what the consumer ultimately hears. Can create new metadata and modify any metadata generated throughout the production and distribution process. Also can set the dialogue normalization (dialnorm) value using the ITU-R BS.1770-1 algorithm. Outputs metadata as separate data stream, to be combined later with the multichannel audio by an encoder. Accepts up to eight audio channels configured as four digital pairs and has two independent sets of outputs. One output provides the program signal in the SMPTE reccommended channel assignment, via a user-controllable built-in router. The second output is the emulator set, facilitating monitoring in different listening modes without affecting the main audio path. This has the 24-bit Cat. no. 548 analog option card installed, activating the Analog I/O 25-pin connectors in the rear (these connectors are always physically present but only active if the card is installed as pictured). This card allows 5.1, 2-channel, and mono outputs available to feed three speaker systems independently. Also gives users control over levels, channel mutes, and channel solos. An additional input and built-in Dolby Pro Logic II and Pro Logic decoders also allow proper monitoring of Lt/Rt sources and downmixes from all other inputs. Includes unit only with Cat 548 analog option card installed - no additional cables or software. This has some cosmetic wear on top panel from rackmounting and to lesser degree on front panel - but overall in presentable condition without damage. Not fully tested to factory spec, only for proper power on and basic button functionality. It did come from working environment and is expected to fully work. We will still guarantee full functionality via our 30 day warranty. 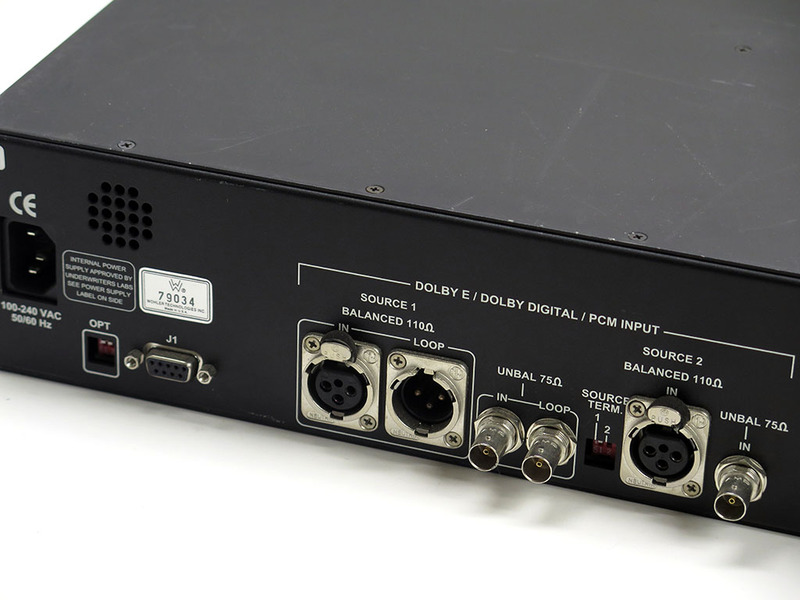 The Dolby DP572 Dolby E Decoder was designed to ease the transition from two-channel to multichannel audio for DTV / HDTV broadcasters and program producers. 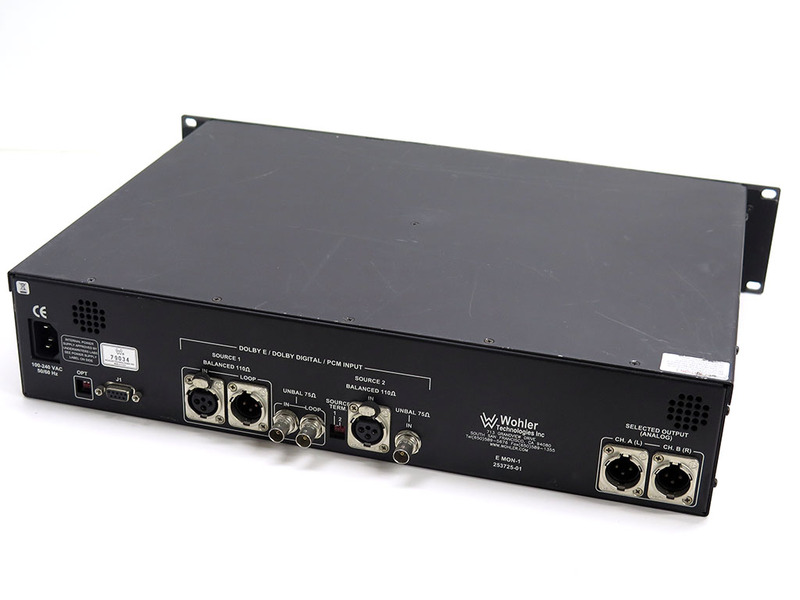 It decodes up to eight channels of high-quality audio, plus Dolby Digital metadata, from a Dolby E signal encoded on a single AES3 pair, external fiber, satellite link, digital videotape, digital audiotape, or from a video server. It's easily integrated into your postproduction and broadcast facilities. The DP572 can accept both PCM and Dolby E signals, and it can switch automatically to provide seamless integration of multichannel and archived stereo programming. Multichannel programming typically uses a "5.1 + 2" Dolby E configuration, with six of the eight channels carrying a 5.1 program and the other two an Lt/Rt (matrix surround-encoded) or stereo two-channel program. Alternate channel configurations are available for multilingual or other specialized applications. 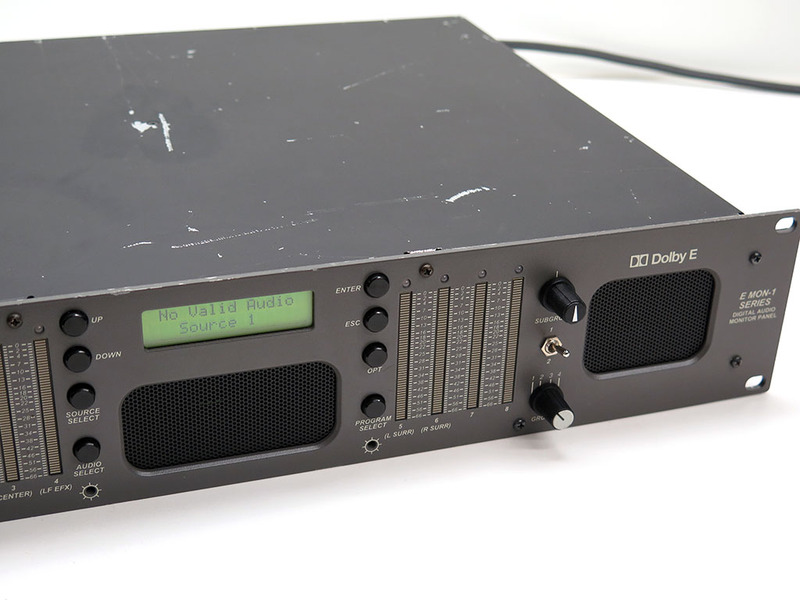 A second input, PCM delay, has multiple functions - insertion of a voiceover into the decoded Dolby E program, insertion of local stereo audio, or automation of switching between stereo and multichannel programming within a transmission chain. Requires a standard video black reference signal. It can also be used in 24-frame applications when accompanied with the Dolby E Tri-Level Sync Interface DP579. This has some cosmetic wear on top panel from rackmounting and to lesser degree on front panel - but overall in presentable condition without damage. Firmware shows version 2.1.0.20. Not fully tested to factory spec, only for proper power on, passing its self diagnostic test, and basic button functionality. It did come from working environment and is expected to fully work. We will still guarantee full functionality via our 30 day warranty. Multiple units available. 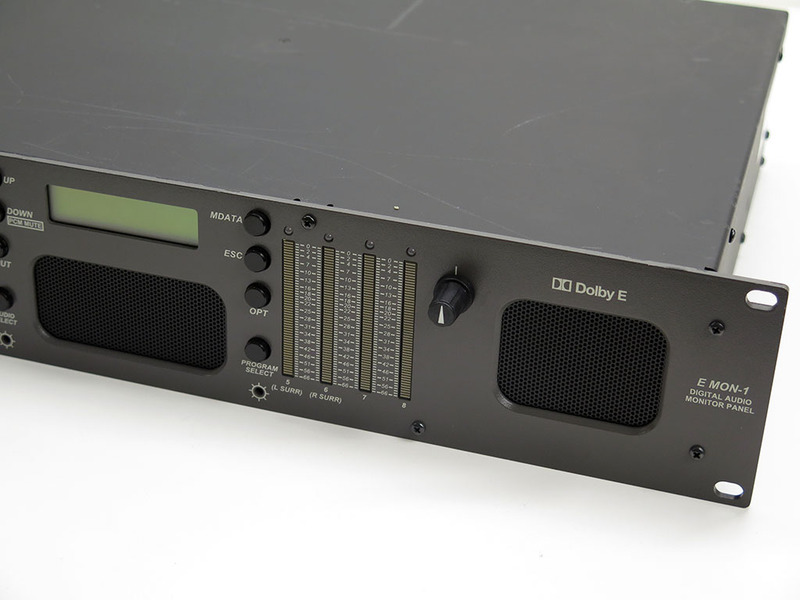 The Dolby LM100 Broadcast Loudness Meter is a tool for measuring the subjective loudness of dialogue within broadcast programming. Applications for the LM100 range from postproduction and quality control to final transmission, program turnaround, and cable head-end facilities. Can use ITU-R BS.1770-1 and BS.1770-2 as the core measurement algorithm. Users can also select Leq(A) or EBU R128. The LM100 can also determine the unweighted peak and a range of other information about the signal, including the Loudness Range measurement specified by the EBU. The LM100 presents its measurements in an easy-to-understand numerical format - eliminating variations in reading VU or PPM meters, neither of which is designed to measure subjective loudness. A set of user-definable alarms and monitoring functions can inform an operator of input loss, signal clipping, high or low signal levels, silence, and incorrectly set dialnorm values. 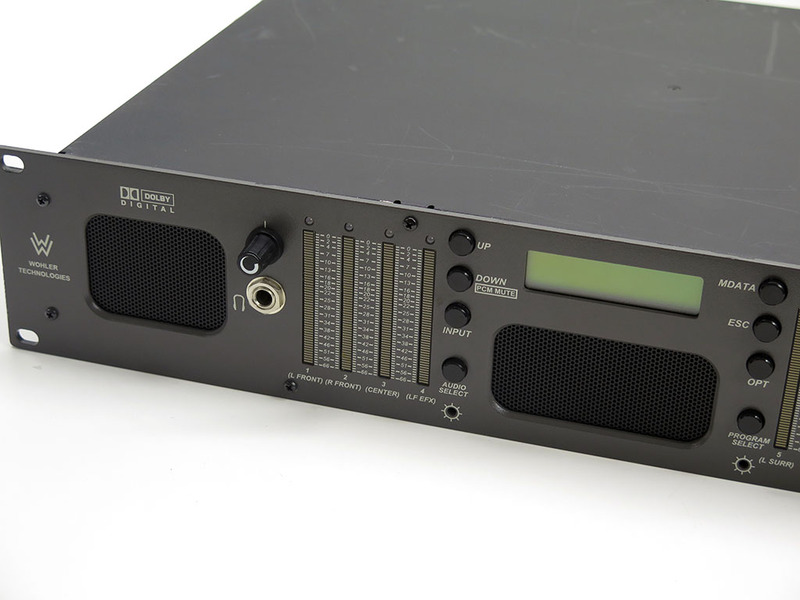 Connections include: analog XLR input, RCA output, digital BNC input, and 9-pin (RS-485, GP I/O, alarm), and headphone. This is the LM100-LTC version (option card cat538 v2 installed) which includes a timecode input, which allows alarm and other signal conditions to be logged to either the internal time-of-day clock or external timecode. Firmware 1.3.1.6. Cosmetically has some wear, mostly on top portion from rackmounting. Tested in good working order. Multiple units are available. The Musicam CDQ Prima 210 ISDN 20 KHz Stereo Bi-Directional digital audio codec box is a 2U, character LCD, basic keypad box that accepts 3 interface modules and has AES/EBU (XLR) digital I/O and dual RS232 ancillary data channels. Universal power supply. 20 bit A/D, AES/EBU or S/PDIF digital audio I/O. Up to 20 kHz bandwidth with better than 92 dB SNR and 0.01 THD+N. Built-in high quality rate adapters allow 24.05, 32, 44.1 and 48 kHz digital audio sampling rates with internal or external synchronization. Fully compatible MUSICAM-enhanced MPEG Layer 2, MPEG Layer 3 and G.722 algorithms support bit rates from 24 through 384 kb/s and sampling rates from 16 through 48 kHz. CCS Inverse Multiplexing, ITU J.52 BONDING and H.221 transport protocol are standard. Adjust MPEG Layer 2 encoding algorithm parameters to tailor the audio to your application. Fully Eureka DAB compatible. BONDING of up to 6 x 64 kb/s channels for contribution quality is based on systems such as DAB ETS300401, ADR spec.1.3 or Direc-TV is supported as well as enhanced features for broadcasting, production studios, advertising and news agencies and many other applications. This has a DIF101 RS-422/X.21 digital interface installed. This seems to be more rare than the DIF102 V.35 and TA301 ISDN U interface most often found. This has noticeable paint wear on top cover from rackmounting and light scratches on front cover, but no damage. Tested for power up and basic button functionality, though not tested fully to factory spec. However, we will guarantee it just the same with our 30 day warranty. Second unit is available. The NAD T 175 AV Tuner Preamplifier has all the control and decoding functions of a receiver (preamplifier, tuner, decoder), while eliminating an integrated power amplifier - so that sound quality is not compromised. Compatible with Dolby TrueHD, DTS-HD Master Audio, Dolby Digital, Dolby Digital Plus, ProLogic II, ProLogic IIx, DTS, DTS ES, DTS 96/24, DTS NEO:6, EARS and Enhanced Stereo Surround Modes. The surround mode of the source material is automatically detected via the digital inputs. Create natural surround sound from any 2-channel source. High resolution and linear D/A converters provide high performance. Video performance is advanced as well. Both analogue and digital video sources can be selectively processed using Sigma’s advanced VXP algorithms - providing features like motion adaptive de-interlacing with edge interpolation, film mode detection, scaling engine for aspect ratio conversion, noise reduction, and detail enhancement. Has a wide variety of connections for anything you can throw at it (HDMI, component, composite, s-video, stereo RCA, coaxial, optical). Capable of 5.1, 7.1, 7.2 output. Multi-room systems can be created using the Zone 2, 3, and 4 outputs. Also has a 7.1 channel input. Also features Audyssey Auto Calibration, MultEQ XT Room Correction, and Dynamic Volume and EQ. Five custom presets store unique speaker level and tone control settings. Direct access speaker level adjustment for surround, center, and subwoofer. RS-232 and 12V triggers for advanced control. And many many more powerful features. This arrived in un-used condition, with factory plastic arround the unit. However, the plastic had holes in the top. So when this was transported, it sustained scratching and wear on the top cover. So this is pristine on all sides and front of unit, even with original LCD protector installed. It was never used, but shows wear on top cover from transportation. This does not include remotes or calibration microphone - thus you would need to add those to fully unlock the features and potential of this unit. It is in good working condition and physically not been used, but does not have the remotes or mic and shows some wear on top, and is priced accordingly to that condition. The RTS by Telex KP96-7 is a matrix intercom control panel, in RTS gray color. Features 16 key keypanel, programming keypad, alphanumeric LEDs for individual keys, separate talk and listen keys, 4 character call waiting window, and permanely mounted gooseneck XLR microphone connection. See photos for available connections. Compatible with KP-96 RC, LCP-100A level control panel and with EKP-96-4 and EKP-96-8, and EKP-95-0 expansion panels. Faceplate is clean with just minor wear, mainly around rackmount holes. There is some typical wear and fingerprint smudges on top and rear. Overall presentable and clean compared to most examples. This has been tested to power up and for button functionality successfully, though not fully tested to factory spec in a complete system. However, it is expected to be fully functional and we will guarantee this as fully functional via our 30 day warranty. 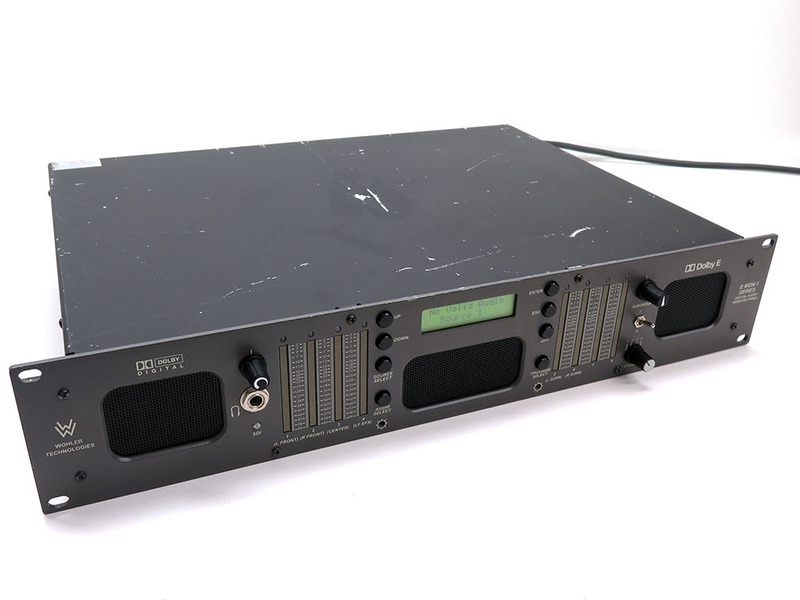 The Vega RMT-14 Multi-Channel Transmitter. Perfect for IFB, PL talent-cueing, and audio monitoring applications. Four channel, private line, VHF wireless transmitter base station in a one rack space. Easy to expand from one transmitter to as many as four by adding internal modules. XLR audio inputs accept line level, or may be individually programmed to be compatible with Clear-Com or RTS wired intercom systems. This has one transmitter module installed. Frequency 176.850. Includes only what is seen, no antennas or receivers. Shows heavy cosmetic wear in the form of rack rash, scratches, paint wear. The C/D switch on rear does not seem to be able to be moved from C position, so assume that switch must remain there. Tested for power up only, not to full factory spec. However, this is still guaranteed by our 30 day warranty to ensure you are satisfied. 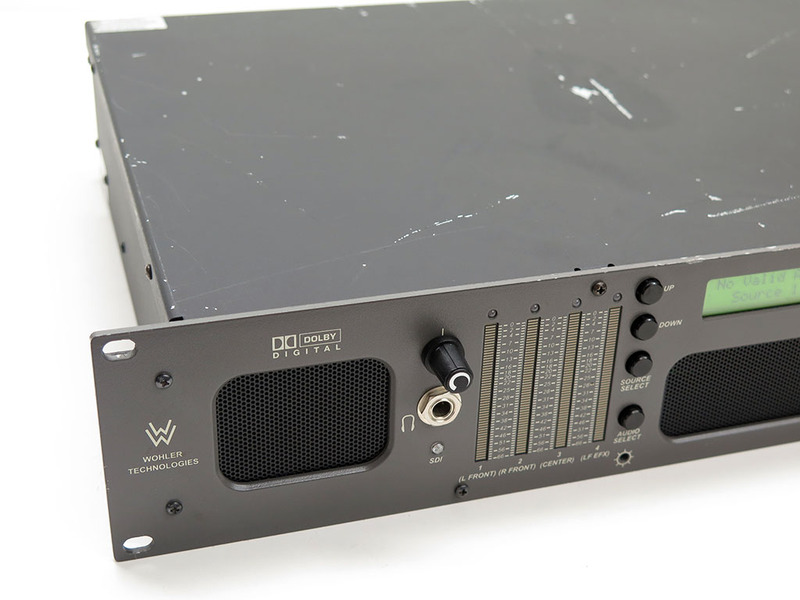 The Wohler E MON-1 is a 8 channel Dolby E, Dolby Digital, and PCM digital audio monitor. Ultra nearfield design to allow higher SPL while reducing ambient sound and crosstalk. Source 1 is either balanced XLR or unbalanced BNC with loop-through. Source 2 is either balanced XLR or unbalanced BNC without loop-through. High quality audio monitoring and level metering in a 2RU space. Powerful 104db SPL at 2' (0.6m). Contains three audiophile quality drivers and three power amplifiers. Features 8x 53-segment tri-color LED level meters, LCD display on front (for settings and status), extensive magnetic shielding, output limiter circuits, analog output of selected pair or multichannel downmix, display of Dolby E / Dolby Digital bit stream metadata information, and headphone jack. There is quite a few noticeable scratches and touchups on top cover from rackmounting. Faceplate is clean and overall gives a clean appearance when installed in rack. Tested in good working order. 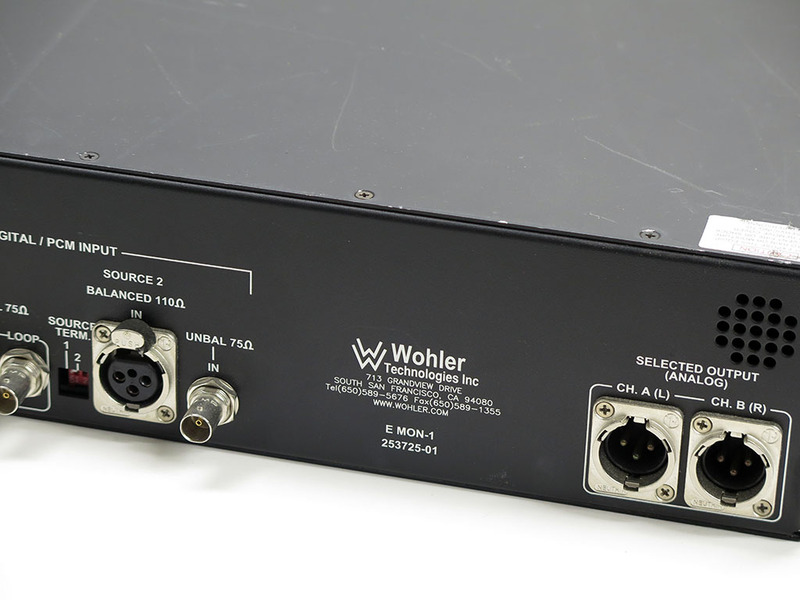 The Wohler E MON-1/HD is a 8 channel Dolby E, Dolby Digital, and PCM digital audio monitor. Ultra nearfield design to allow higher SPL while reducing ambient sound and crosstalk. Capable of displaying and outputting audio deembedded from HD-SDI inputs (not compatible with SD-SDI). High quality audio monitoring and level metering in a 2RU space. Powerful 104db SPL at 2' (0.6m). Contains three audiophile quality drivers and three power amplifiers. Features 8x 53-segment tri-color LED level meters, LCD display on front (for settings and status), extensive magnetic shielding, output limiter circuits, analog output of selected pair or multichannel downmix and headphone jack. Good cosmetic condition with a clean faceplate and some scratches and paint touchups on top cover from rackmounting. The BNC unbalanced input has damage, though still works (and is most likely not the connector you will be using on this anyway). Tested in good working order. 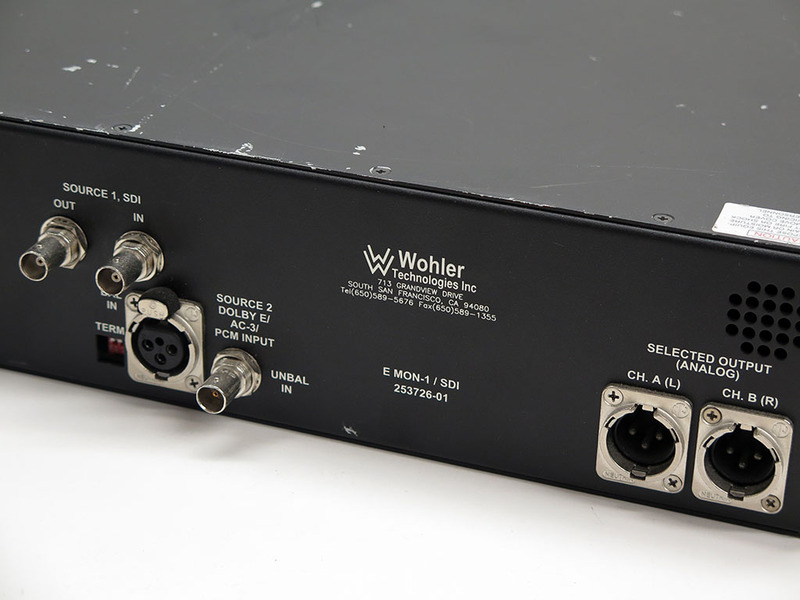 The Wohler E MON-1/M is a 8 channel Dolby E, Dolby Digital, and PCM digital audio monitor. Ultra nearfield design to allow higher SPL while reducing ambient sound and crosstalk. Capable of displaying and outputting audio deembedded from HD-SDI and SD-SDI inputs. High quality audio monitoring and level metering in a 2RU space. Powerful 104db SPL at 2' (0.6m). Contains three audiophile quality drivers and three power amplifiers. Features 8x 53-segment tri-color LED level meters, LCD display on front (for settings and status), extensive magnetic shielding, output limiter circuits, analog output of selected pair or multichannel downmix and headphone jack. Good cosmetic condition with a clean faceplate and minor scratches on top cover. Tested in good working order. Second unit available. 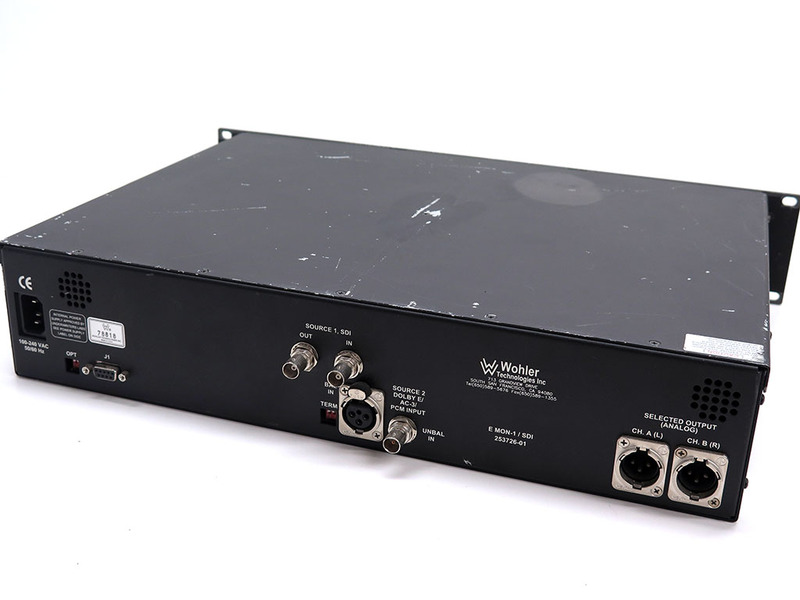 The Wohler E MON-1 / SDI is a 8 channel Dolby E, Dolby Digital, and PCM digital audio monitor. Ultra nearfield design to allow higher SPL while reducing ambient sound and crosstalk. Capable of displaying and outputting audio deembedded from SD-SDI inputs. High quality audio monitoring and level metering in a 2RU space. Powerful 104db SPL at 2' (0.6m). Contains three audiophile quality drivers and three power amplifiers. Features 8x 53-segment tri-color LED level meters, LCD display on front (for settings and status), extensive magnetic shielding, output limiter circuits, analog output of selected pair or multichannel downmix, and headphone jack. 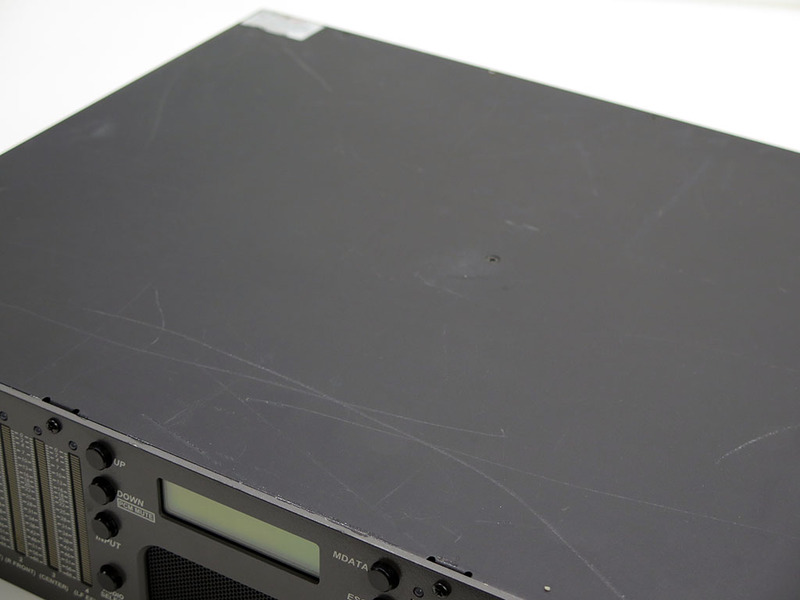 Good cosmetic condition with a clean faceplate, though has noticeable scratches on top panel from rackmounting. Tested in good working order.